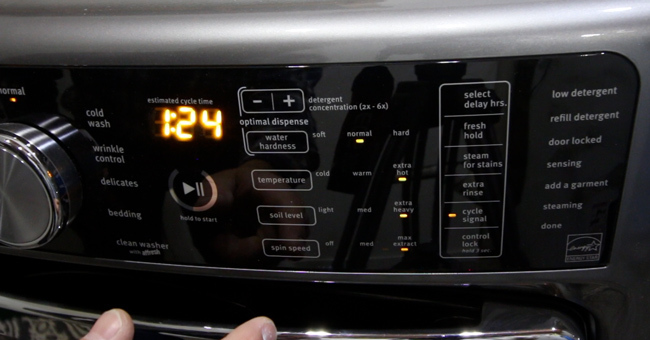 ​This post and episode are sponsored by our friends over at Maytag®. I received compensation, and only partner with brands I truly believe in. The renovations are in full swing at the new home and finishing each room is beyond rewarding. 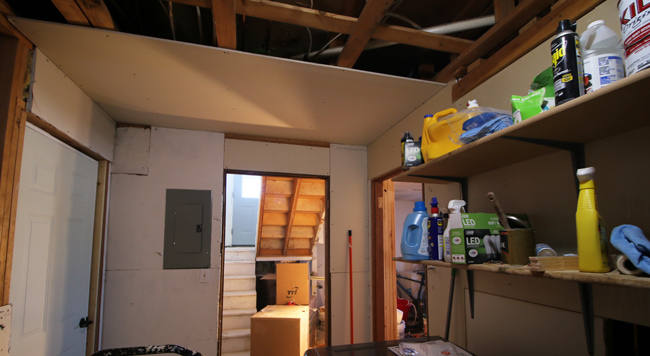 In the last episode we took an outdated garage and gave it insulation, new walls, electrical outlets, and lighting. 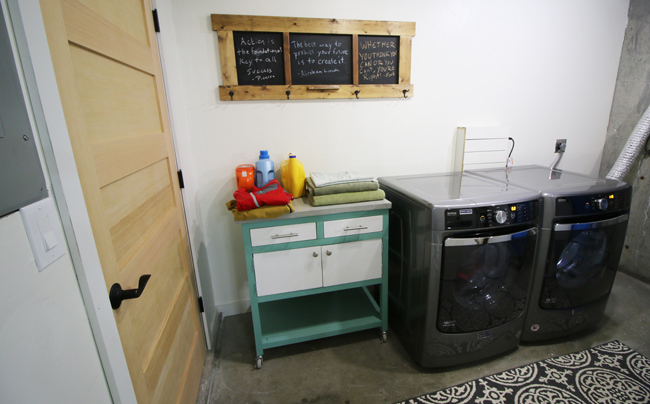 For today's episode, we'll walk through the process of giving the laundry room a makeover. The laundry room was dated to say the least. 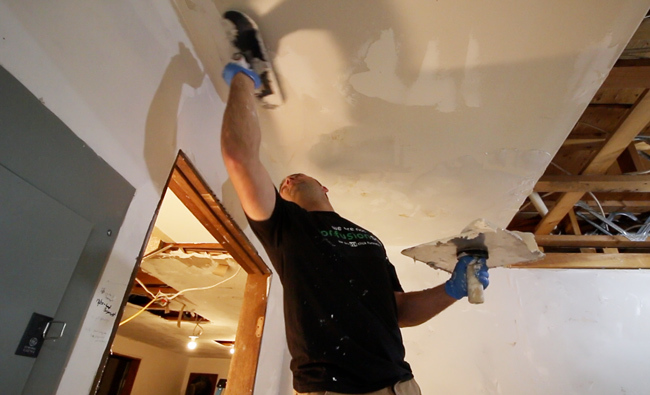 There was some drywall in place, but it needed work and some needed to be replaced. The old shelving was sagging, and I desperately needed a new washer and dryer. The appliances that came with the home were from the 1990's and they'd seen better days. I did a lot of research in deciding which brand of appliances to use in the home. I wanted all stainless steel appliances in the kitchen, and a sleek and quiet washer and dryer for the laundry room. That's when I came across the Maytag® front loading washer dryer. They both had great reviews on a number of websites. Plus, I had always had Maytag® appliances in my old home and was very happy with them. I officially partnered with the brand because I knew it was a great fit and that I would be confident recommending their appliances to peers, and pleased with their products performance in my own home. Thus, this post and episode is sponsored by our friends over at Maytag. I was compensated for using their products, and only partner with brands I truly believe in. 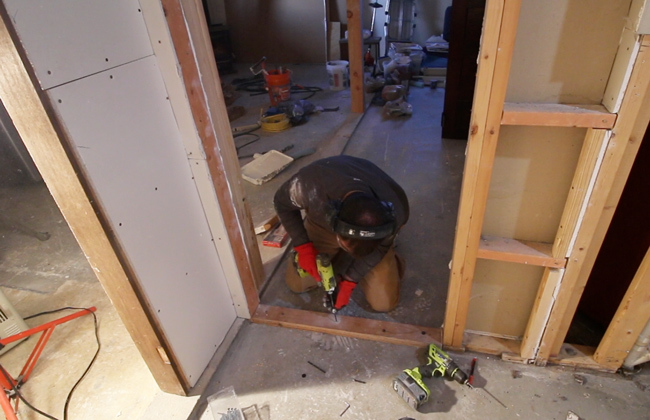 I started the project by removing an old door jam and framing out where the door used to be. I attached a pressure treated board to the ground by pre-drilling with a hammer drill. Next, I used 3 inch long concrete screws to secure the board to the ground. 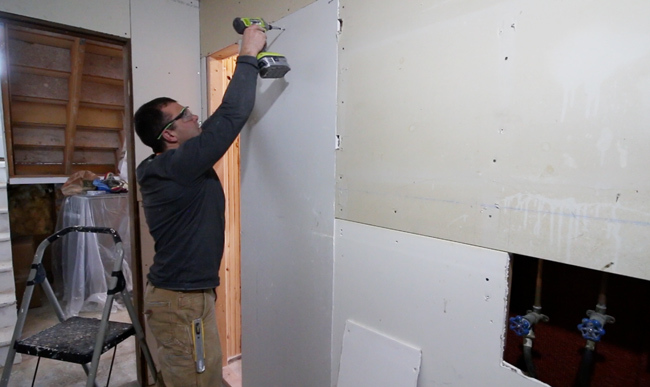 The next step was to drywall over the newly framed out area. I attached it with drywall screws. I'd typically use larger sheets, but I had already been to the hardware store once so I figured I'd simply use the scraps I had on hand. 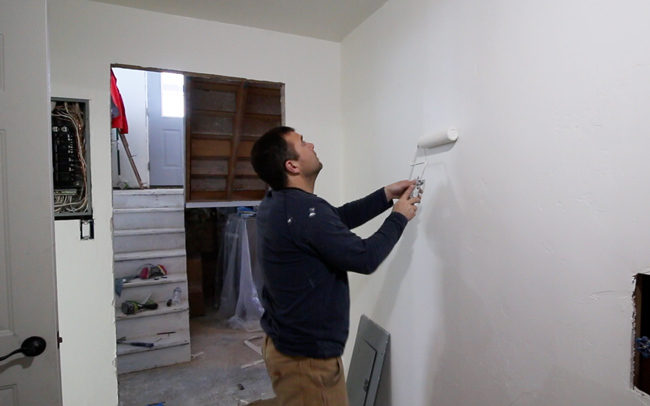 After the drywall was hung, I taped the seems using the basic paper drywall tape. I laid a thin layer of mud at the joint before adding the tape, and used a drywall knife to pull the tape taunt and to feather out the drywall. This takes some practice, but a garage or laundry room are great places to practice. I used a pool trowel to add a trowel finish to the walls and ceiling. I used random swirl patterns to get the variation I was going for. 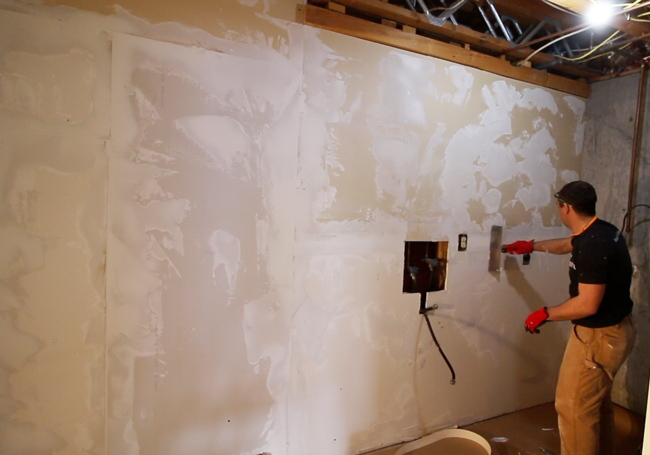 I like to slightly water down the drywall mud for the texture so it is easier to work with. After texturing, I let the mud dry and then sanded the walls and ceiling. The laundry room doesn't have any natural light from windows, so I wanted to use a light colored paint. I chose Alabaster, which is a nice looking white paint that I've used in other parts of the house. I primed the drywall and then rolled on two coats of paint. 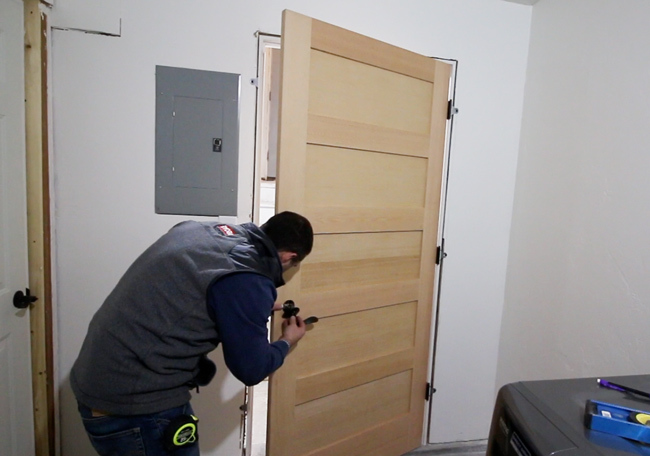 The doors in the home are all 5 panel solid Fir wood. I hung a 36 inch wide door using quick door hangers which makes the process very easy. I used 1x3 painted pine trim around the door and 1x4 trim for most of the baseboard. It was attached with two inch long finish nails. The next step was to install the appliances. I attached the cold water and hot water hoses to the back of the machine. 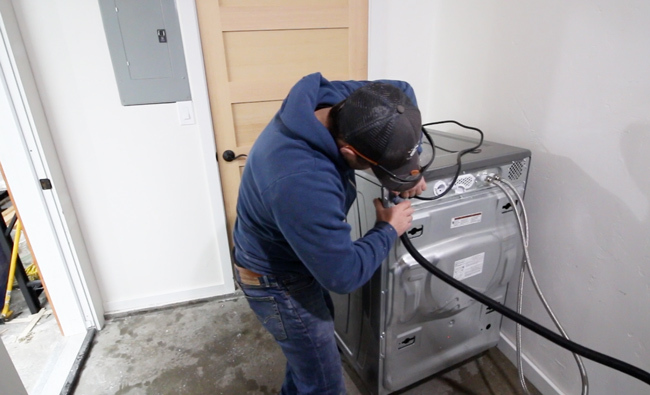 I then clamped the washer drain hose to the back, and ran the hose to the drain pipe behind my wall. Next, I installed the dryer. I wired a 3 prong plug cord to it and it was ready to go! Now it was time to test out the machines. They both fired right up and were easy to use. 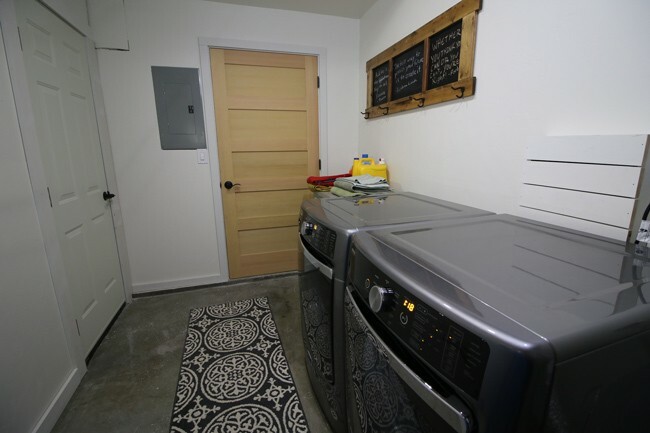 There all sorts of features to ensure you get your clothing washed and dried as best as possible, like the PowerWash® cycle that uses extra cleaning action and an internal heater. If you're interested in learning more about a laundry set like mine, visit www.maytag.com.